Discover the wild side of the Arno river. From the city center to historical mills running together with a running architect who’s is going to tell you the story of the town and the river. 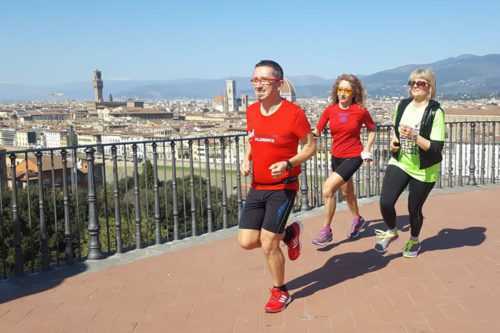 From the heart of historical Florence we will run along the river through the typical ancient narrow streets of the city center. Starting from Ponte Vecchio with the small gold shops that still today surrounds the bridge, we run east following the river with the beautiful scenery of the colourfull facades reflecting in the water. Thereafter we run through the park of Anconella, the ancient water treatment plant and on a nice bike path just by the river, where is easy to see waterfowls until we reach the nice historical mill of Rovezzano with a hidden surprise. A running tour that combines the history of Florence with the green side of this gem of an Italian city. A break of peace and reflection. In the early morning you can enjoy the sunrise over the river or in late afternoon the sunset with the old town skyline in front of it. This tour is suitable for every kind of runner and the course is all flat and easy. The tour duration is up to your personal pace, but just to have and idea it usually takes from 1.5 to almost 2 hours. Meetup service: Meetup service from your hotel/apartment or another meeting point is possible and will be checked by the tour provider individually. If your hotel/apartment should be too far away from the city centre or not close to the tour route, then we will meet you at our standard meeting point at Ponte Vecchio.